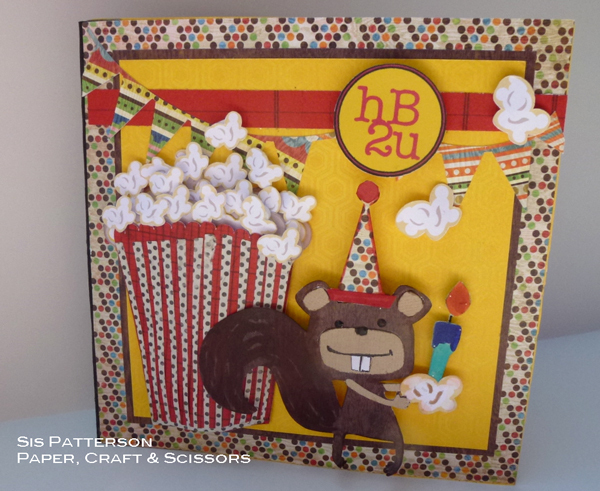 A bright and cheerful birthday card as requested by my friend for a member of her staff. The popcorn box and the popcorn kernels are both from the Silhouette online store. Despite my large Cricut library, I didn’t have a single popcorn cut. I also picked up the pennant bunting at the Silhouette store. There are multiple layers of popcorn kernels. The “birthday cake” kernel was sized larger than the ones in the box. I used the print and cut feature and filled an 8.5″ x 11″ page with various sizes of kernels – what a great capability. I made the “HB2U” circle die cut using the Silhouette Designer Studio software with my printer and cut it with the Silhouette Cameo. The squirrel and the birthday candle are from the Birthday Bash cartridge. The squirrel was cut at 2.75″ tall and the candle was cut at 1.75″ tall. 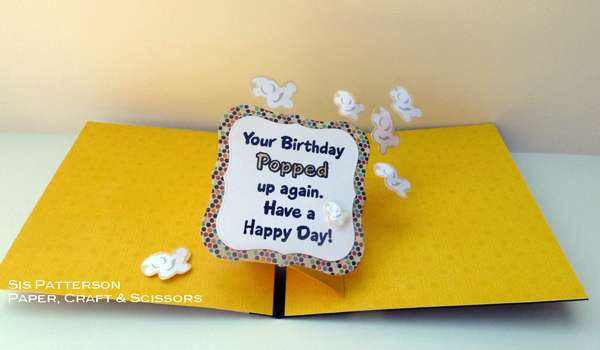 The inside of the card is a popup using the Spinning Platform mechanism from Sizzix. The sentiment is stamped and an extra frame of patterned papers. Spellbinders nestabilities were used to cut the sentiment and the frame. The “flying” kernels were attached via acetate strips to the sentiment. The card measures 6 inches square to make sure that all the staff has room to sign it. Very cute! I love the way the kernels pop out! Adorable card. I love to make pop up cards too. I love your take on the popcorn idea. Very clever. I love the pop up action of the popcorn– so clever (as always). And… I adore the images! Your popcorn looks real and your critter looks full of personality! I love the energy and colors– and the spirit of the whole project! It just screams “happy” and it is impossible not to absolutely love it! You had to finish that one and smile! And you know if you keep making them with this kind of quality, detail, and craftsmanship, you will never, ever be able to avoid being asked to do so! I just can’t get over the popping popcorn! It is too cute!! Another wonderful card. I was going to tell you that I love the popcorn on the front. Then I scrolled down and saw the popped popcorn on the inside – so cute! Really a fantastic job you did here! This card is fun! I love the pop up popcorn and the birthday wish. The card is a totally awesome. I love all of this! These are all so wonderful!! And thank you so much for visiting my blog and leaving such sweet comments! What a super fun bday card. Love the silhouette cricut combo package!! I love having the Cameo…I have a Cricut but the Cameo cuts any font I want!! Your fantabulous birthday project is being highlighted today for Fantabulous Cricut Challenge Blog Fantabulous Friday. Hope you will join us.